Mary Clare is a fourth year Ph.D. student working to create a tissue engineered meniscus. 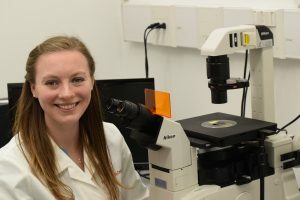 She is specifically studying the mesenchymal stem cell applications in tissue engineering the meniscus and meniscus-to-bone interface. Mary Clare is from Marshfield, Massachusetts. While an undergraduate at WPI, she sang a cappella and did musical theatre. Now that she’s at Cornell she has embraced her inner explorer and loves hiking and paddling with her dog Ruari.